This mural was commissioned to enliven a windowless bathroom and extends thematically on two walls and incorporates a painted sky ceiling. (The unpainted walls were of plate mirror and mosaic tile). The whole was treated as a decorative mural with no strict attempt to deceive the eye. 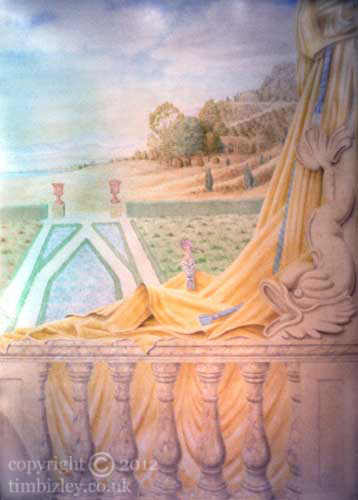 Architectural elements and swags were chosen for the immeadiated foreground to lend depth to the rest of the painting. Painted decorative murals of this type can confer a significant amount of grace to what would otherwise have been felt to have been a claustrophobic and uninspiring space. The decorative mural in the hands of a competent muralist offers the opportunity to transform interiors in a way in which no other medium can.